This guide is intended for technical specialists, sales specialists, sales engineers, IT architects, and other IT professionals who want to learn more about the SR590 server and consider its use in IT solutions. Featuring the Intel Xeon Processor Scalable Family, the SR590 server offers balanced performance, storage capacity, and I/O expansion. The SR590 server supports up to two processors, up to 1 TB of 2666 MHz TruDDR4 memory, up to 16x 2.5-inch or 14x 3.5-inch drive bays with an extensive choice of NVMe PCIe SSDs, SAS/SATA SSDs, and SAS/SATA HDDs, and flexible I/O expansion options with the LOM slot and up to 6x PCIe slots. The SR590 server offers basic software RAID or advanced hardware RAID protection and a wide range of networking options, including selectable LOM, ML2, and PCIe network adapters. The next-generation Lenovo XClarity Controller, which is built into the SR590 server, provides advanced service processor control, monitoring, and alerting functions. The following figure shows the ThinkSystem SR590 models. The SR590 server features a unique AnyBay design that allows a choice of drive interface types in the same drive bay: SAS drives, SATA drives, or U.2 NVMe PCIe drives. The SR590 server offers onboard NVMe PCIe ports that allow direct connections to the U.2 NVMe PCIe SSDs, which frees up I/O slots and helps lower NVMe solution acquisition costs. The SR590 server delivers impressive compute power per watt, featuring 80 PLUS Titanium and Platinum redundant power supplies that can deliver 96% (Titanium) or 94% (Platinum) efficiency at 50% load when connected to a 200 - 240 V AC power source. The SR590 server is designed to meet ASHRAE A4 standards (up to 45 °C [113 °F]) in select configurations, which enable customers to lower energy costs, while still maintaining world-class reliability. The SR590 server offers a balance of processing power, storage capacity, and cost for small and medium businesses up to the large enterprise. Ease of use and comprehensive systems management tools help make deployment easier. Outstanding reliability, availability, and serviceability (RAS) and high-efficiency design improve your business environment and help save operational costs. Offers flexible and scalable internal storage in a 2U rack form factor with up to 16x 2.5-inch drives for performance-optimized configurations or up to 14x 3.5-inch drives for capacity-optimized configurations, providing a wide selection of SAS/SATA HDD/SSD and PCIe NVMe SSD types and capacities. Simplifies servicing, speeds up problem resolution, and helps improve system availability with light path diagnostics. The following figure shows the front of the SR590 server with up to 16x 2.5-inch drive bays. The following figure shows the front of the SR590 server with 8x 3.5-inch drive bays. The following figure shows the front of the SR590 server with 12x 3.5-inch drive bays. Up to 16x 2.5-inch or 12x 3.5-inch hot-swap, or 8x 3.5-inch hot-swap or Simple Swap drive bays. The following figure shows the rear of the SR590 server. Up to six PCIe expansion slots (depending on the riser cards selected). 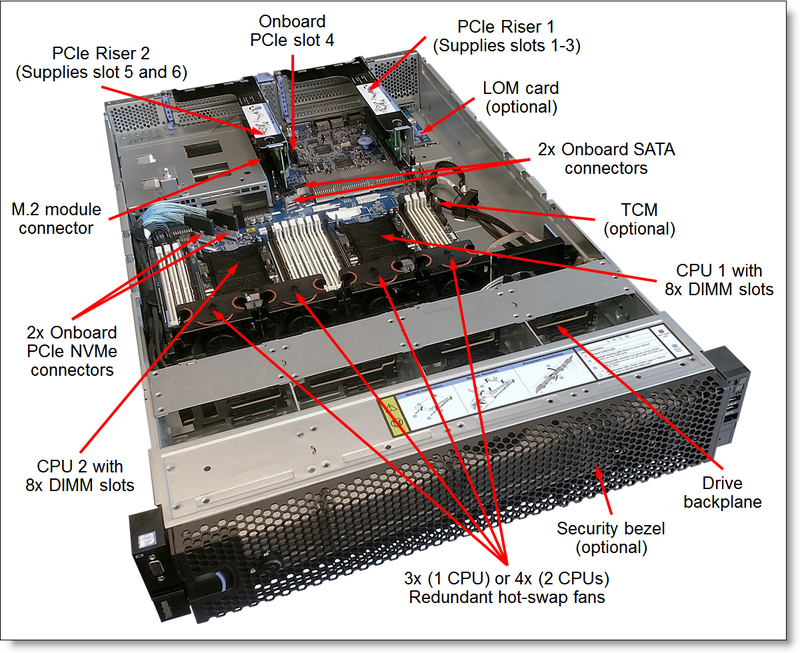 The following figure shows the locations of key components inside the SR590 server. Three (one processor) or four (two processors) hot-swap system fans. The following table lists the system specifications for the SR590 server. 2.5-inch models: Up to 122.88 TB with 16x 7.68 TB 2.5" SAS/SATA SSDs. 3.5-inch models: Up to 196 TB with 14x 14 TB 3.5" NL SAS/SATA HDDs. Cooling Three (one processor) or four (two processors) hot-swap system fans with N+1 redundancy. Warranty One-year (7X98) or three-year (7X99) customer-replaceable unit (CRU) and onsite limited warranty with 9x5 Next Business Day Parts Delivered. Configure-to-order (CTO) models can also be created for factory-integrated server customization. The following table lists the base CTO models of the ThinkSystem SR590 server. The following table lists the base chassis for CTO models of the SR590 server. Tool-less Rail Kit: "S" = Slide; "F" = Friction; "N" = Not included, optional (for the slide rail kit only). The SR590 server supports one or two Intel Xeon Bronze, Silver, Gold, or Platinum processors of up to 150 W TDP. The following table lists the specifications of the processors for the SR590 server. For the SR590 server models that come standard with one processor, the second processor can be ordered, if required (see the following table for ordering information). The second processor must be of the same model as the first processor. The second processor option includes a processor, a heatsink, and an additional system fan. The SR590 server supports up to 8 TruDDR4 memory DIMMs with one processor and up to 16 DIMMs when two processors are installed. Each processor has six memory channels, and there is a one DIMM per channel for four channels and two DIMMs per channel for two channels for a total of 8 DIMMs per processor. The following table lists memory options available for the SR590 server. In addition, the SR590 server models can be configured with one or two internal M.2 SATA SSDs. The server also supports configurations without drive bays. The following table lists the internal storage options for the SR590 server. 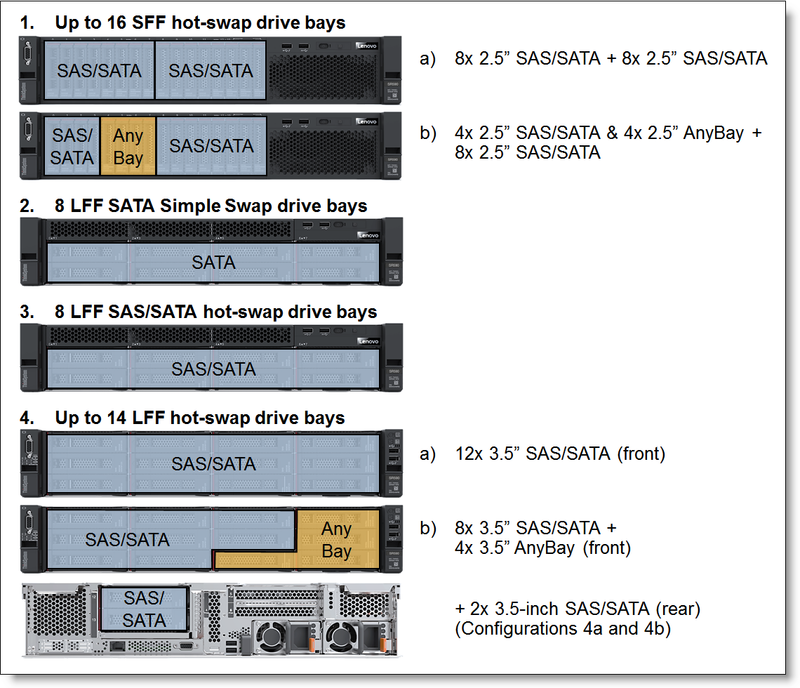 The 2.5" SATA/SAS 8-Bay Backplane Kit (4XH7A08763) adds 8x 2.5" SAS/SATA hot-swap drive bays to the previously configured models that support drive bay expansion capabilities. The 2.5" AnyBay 8-Bay Backplane Kit (4XH7A08764) adds 4x 2.5" SAS/SATA & 4x 2.5" AnyBay hot-swap drive bays to the previously configured models that support drive bay expansion capabilities. Models without any drive bays that are based on the 16x 2.5" chassis (feature code AXEA) support adding drive bays by using the 2.5" SAS/SATA 8-bay backplane kit (4XH7A08763) or 2.5" AnyBay 8-bay backplane kit (4XH7A08764). Models without any drive bays that are based on the 12x 3.5" chassis (feature code AXEB) include the Right EIA Latch with FIO (USB ports, status LEDs, and a power button). These models support adding drive bays by using the 3.5" 8-bay backplane kit (4XH7A08770), 3.5" 12-bay backplane kit (4XH7A08771), or 3.5" AnyBay 12-bay backplane kit (4XH7A08785). 2x 3.5-inch rear drives are supported only on the models with 12x 3.5-inch hot-swap drive bays. The 3.5" Rear HDD Kit is connected to a separate port on the internal storage controller. The 3.5" Rear HDD Kit is installed in place of the PCIe Riser Card 1; PCIe slots 1, 2, and 3 are not present. Models with 12x 3.5-inch drive bays and an 8-port SAS RAID controller or HBA support only NVMe drives in the AnyBay drive bays. ** The onboard NVMe controller requires the second processors to be installed. ^ The 1610-4P NVMe Switch Adapter is supported only in the configurations with one processor. The following table lists the storage controllers and options for internal storage of the SR590 server. Low profile SAS RAID controllers and HBAs for internal storage are supported in the PCIe x8 slot 4 on the system board and full-high PCIe x8 and x16 slots supplied by the riser cards 1 and 2. The 1610-4P NVMe Switch Adapter provides 4x PCIe 3.0 x4 ports for JBOD (non-RAID) connectivity to U.2 NVMe PCIe SSDs in the AnyBay drive bays, and it is supported in the PCIe x16 slot 1 supplied by the x16/x8 riser card 1 in the configurations with one processor only. A combination of the RAID 530-8i, 730-8i 1GB, 730-8i 2GB, and 930-8i controllers is not allowed in the server configuration; if two PCIe RAID 8i controllers are used in the server configuration, both RAID controllers must be of the same model. The following tables list drive options for the SR590 server. Configuration note: The M.2 5100 SATA 6Gbps Non-Hot Swap SSDs require the SSD Thermal Kit (4XH7A08791) (see Cooling for details). The SR590 server supports the external USB optical drive option listed in the following table. The SR590 server supports one LOM card slot and up to six PCIe slots: one PCIe slot on the system planar and up to five PCIe slots with different riser cards installed into two riser sockets on the system planar (one riser socket supports installation of one riser card). Slot 4 is not present if the COM Port Upgrade Kit is installed. Riser 1 supplies slots 1, 2, and 3, and Riser 2 supplies slots 5 and 6. 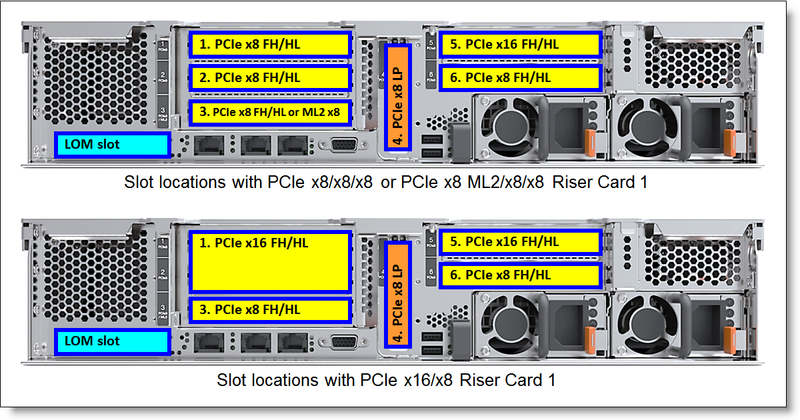 The slots that are available for use depend on the number of riser cards that are installed and whether the second processor is installed, as shown in the following table. The COM Port Upgrade Kit, part number 7Z17A02577, is used for mounting the external serial port on the rear of the SR590. This option includes the bracket and the cable. The COM Port option is mounted in place of the PCIe slot 4, and the PCIe slot 4 cannot be used. The SR590 server has two onboard 1 GbE ports (no 10/100 Mb support) and up to two additional onboard 1/10 GbE network ports (no 10/100 Mb support) with optional LOM cards. Onboard ports and LOM cards use the Intel Ethernet Connection X722 1/10 GbE technology integrated into the Intel C622 Platform Controller Hub (PCH). The server also supports ML2 adapters that are installed in the custom ML2 slot provided by an ML2 riser card. The LOM cards support direct connectivity to the XClarity Controller via the Network Controller Sideband Interface (NSCI) for out-of-band systems management. Note: ML2 network adapters do not support NSCI when used in the SR590 server. The following table lists the network adapters that are supported with the SR590 server. # The maximum quantity shown is with one processor / two processors (this does not apply to LOM cards and ML2 adapters). * The adapter comes without transceivers or cables; for ordering transceivers or cables, see the configuration notes below. ML2 network adapters are supported in the ML2 x8 slot 3 supplied by the x8 ML2/x8/x8 Riser Card 1 (4XH7A08778). PCIe full-height network adapters are supported in the full-height PCIe x8 and x16 slots supplied by the riser cards 1 and 2. PCIe Low Profile network adapters are supported in the low profile PCIe x8 slot 4 on the system board and full-height PCIe x8 and x16 slots supplied by the riser cards 1 and 2. Some adapters require supported transceivers or DAC cables to be purchased for the adapter. The maximum number of transceivers or cables that are supported per adapter equals the quantity of the adapter ports, and all adapter ports must have the same type of the transceiver or cable selected. The following table lists SAS RAID controllers and HBAs for external storage attachments that are supported by the SR590 server. Low profile SAS RAID controllers and HBAs for external storage are supported in the low profile PCIe x8 slot 4 on the system board and full-high PCIe x8 and x16 slots supplied by the riser cards 1 and 2. The total quantity of the RAID 730-8i 2GB, 930-8i, 930-16i, and 930-8e controllers in the server must not exceed 3 (up to 3 supercapacitors can be mounted in the server). The following table lists Fibre Channel HBAs supported by the SR590 server. Configuration note: FC HBAs are supported in the low profile PCIe x8 slot 4 on the system board and full-high PCIe x8 and x16 slots supplied by the riser cards 1 and 2. The SR590 server supports the flash storage adapters listed in the following table. Configuration note: Flash storage adapters are supported in the low profile PCIe x8 slot 4 on the system board and full-high PCIe x8 and x16 slots supplied by the riser cards 1 and 2. The SR590 server supports up to four hot-swap system fans that provide N+1 cooling redundancy. SR590 server models with one processor include three system fans, and server models with two processors include four system fans. Configuration note: If Intel Xeon 5122, 6140, 6152, 8156, 8158, 8160, or 8164 processors are installed in the server models with 12x 3.5-inch drive bays, the server performance might be impacted in case of a system fan failure. The following table shows additional cooling options for configurations with the M.2 5100 SSDs. The M.2 SSD Thermal Kit (4XH7A08791) is required in the configurations with at least one M.2 5100 SSD is installed in the server with 12x LFF front drive bays. The M.2 SSD Thermal Kit is derived by the configurator if M.2 5100 SSDs are selected in the initial configurations for server models with 12x LFF front drive bays. For field upgrades, the M.2 SSD Thermal Kit should be purchased with M.2 5100 SSDs for server models with 12x LFF front drive bays. The SR590 server supports up to two redundant power supplies, and is capable of N+N redundancy depending on the configuration. A second power supply can be added to the models that come with one power supply. The SR590 server ship standard with or without a power cord (model dependent). A hot-swap power supply option ships without a power cord. The following table lists the country-specific line cords and rack power cables that can be ordered for the SR590 server. The S590 server contains Lenovo XClarity Controller (XCC), which provides advanced service-processor control, monitoring, and alerting functions. XClarity Controller offers three functional levels: Standard, Advanced, and Enterprise. By default, the SR590 server includes XClarity Controller Standard features, and it can be upgraded to Advanced or Enterprise functionality by using the Features on Demand (FoD) upgrades. All SR590 server models include basic light path diagnostics, which provides the system error LED on the Operator information panel on the front of the server and the LEDs near the monitored components (for example, the DIMM error LEDs on the system board). Lenovo XClarity Administrator is an optional software component for the SR590 server which can be downloaded and used at no charge to discover and monitor the SR590 and manage firmware upgrades for them. Lenovo XClarity Energy Manager is an optional software component for the SR590 server that is licensed on a per managed node basis, that is, each managed server requires a license. The 1-node Energy Manager license is included in the XClarity Controller Enterprise upgrade. The following table lists the security options that are available for the SR590 server. The following table lists the rack installation options that are available for the SR590 server. Configuration note: If an M.2 kit is installed the server models with 12x 3.5-inch drive bays, the operating environment should not exceed ASHRAE A3 specifications. The SR590 server has a one-year (7X98) or three-year (Machine Type 7X99) customer-replaceable unit (CRU) and onsite limited (for field-replaceable units [FRUs] only) warranty with standard call center support during normal business hours and 9x5 Next Business Day Parts Delivered. The following table lists the 12 Gbps SAS external drive enclosures that are offered by Lenovo that can be used with the SR590 for storage expansion. The following table lists the external storage systems that are currently offered by Lenovo that can be used with the ThinkSystem SR590 server for external NAS, SAS, iSCSI, or FC storage connectivity. The following table lists the external backup options that are offered by Lenovo that can be used with the ThinkSystem SR590 for backup solutions. The following table lists the Ethernet LAN switches that are offered by Lenovo that can be used with the ThinkSystem SR590 for network connectivity. The following table lists currently available Fibre Channel SAN switches that are offered by Lenovo that can be used with the ThinkSystem SR590 for external FC SAN storage connectivity. The following table lists the rack cabinets that are currently offered by Lenovo that can be used for mounting the ThinkSystem SR590 and other IT infrastructure building blocks. The following table lists the KVM switches and consoles that are offered by Lenovo that can be used for providing console access to the ThinkSystem SR590. The following table lists the power distribution units (PDUs) that are currently offered by Lenovo that can be used for distributing electrical power to the ThinkSystem SR590 and other IT infrastructure building blocks mounted in a rack cabinet. The following table lists the uninterruptible power supply (UPS) units that are currently offered by Lenovo that can be used for providing electrical power protection to the ThinkSystem SR590 and other IT infrastructure building blocks.